Crude oil and other risky assets are sky rocketing since the opening of the market today due to the US-China trade truce. Even though Crude was never included in the list of the tariffs, the positive sentiment in the markets seems to have put a bid on the black gold. Furthermore, the probability of OPEC and non-OPEC countries announcing supply cuts this week is highly likely and this is also fueling the strong upside momentum. 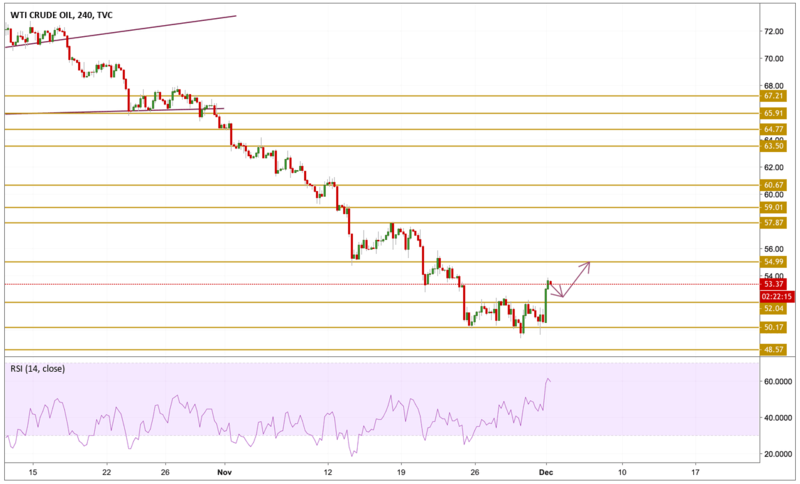 After trying to break and settle below the $50.17 support level on numerous occasion, Crude oil prices had a breakout to the upside by more than 5% since this morning. The price is currently above the $53 level with a bullish momentum as we can see on the chart and looks ready to retest the $55 resistance level that is why we will be focusing on this level.